A special re-post for Valentine’s Day. Enjoy! One of my favorite photographic genres is capturing images of couples. 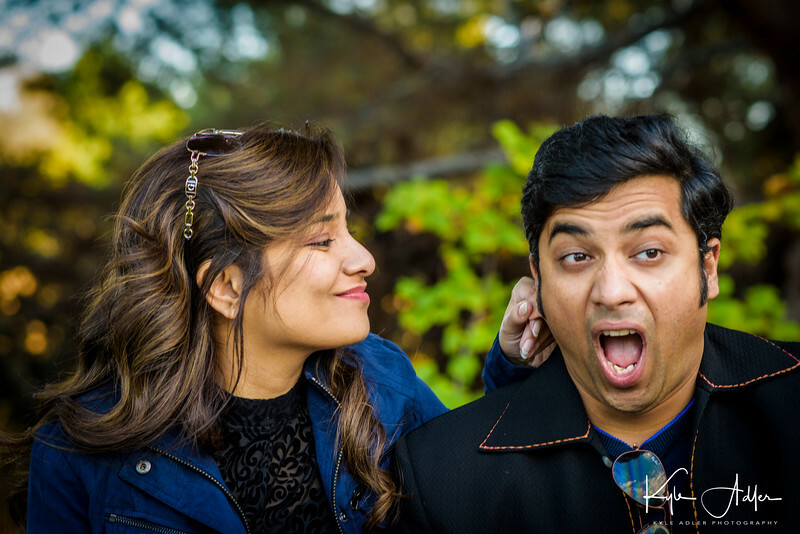 Whether it’s a pre-wedding shoot to make images for use in the couple’s wedding invitations or a holiday or anniversary shoot for use in cards and social media, these assignments are great fun because each is as unique as the couple themselves. Today’s post is a case study of couples portraiture based on a recent pre-wedding shoot I did for Gayathri and her fiance Abhishek. Many photographers make the mistake of assuming they need a lot of cumbersome and expensive gear to make professional images of couples. In fact, in most of my couples photo sessions I use only two DSLR bodies, each fitted with a different fast prime lens (in this case, a 50mm f/1.4 and an 85mm f/1.8), and a set of inexpensive reflectors and diffusers. A speedlight or two can also be helpful, but for on-location couples shoots there is rarely any need for studio lighting. Keep it light and simple, and stay open to the special moments that truly show the couple’s distinctive style and love for each other. 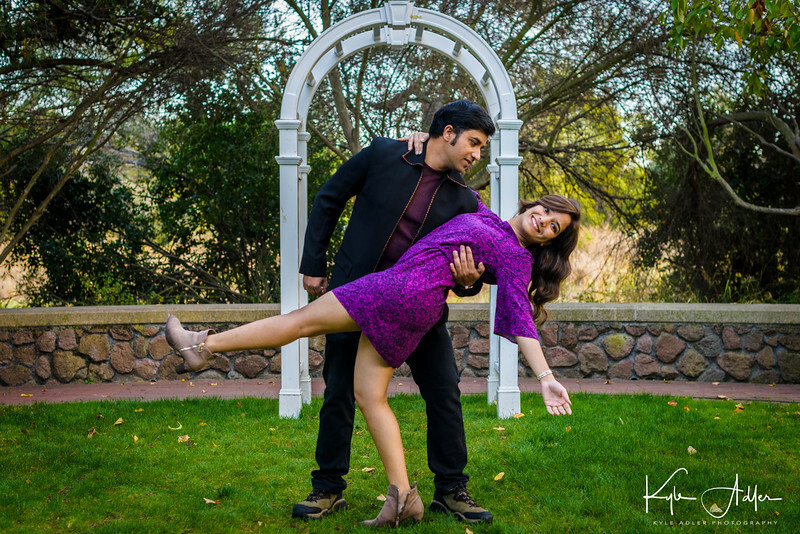 Gayatrhi and Abhishek were great fun to shoot because of their distinctive, dynamic, and theatrical style. 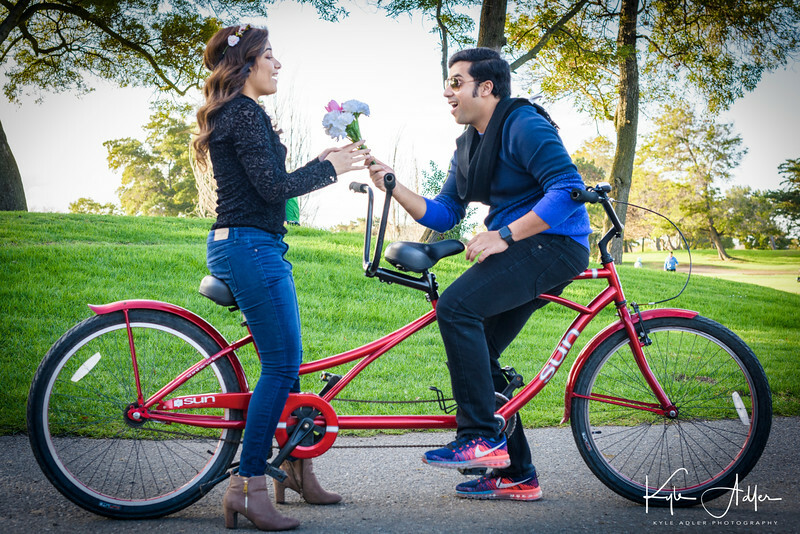 With the rental of a tandem bicycle and the addition of a simple floral bouquet prop, we were ready to capture amazing images of the two of them interacting. A fast prime lens allows quick and easy shooting, the choice of a wide range of apertures to control depth-of-field, and the option to freeze action with a fast shutter speed. Not all couples shots have to be posed and static. I love capturing the couple in motion to get a sense of the thrill and excitement they feel by being together. 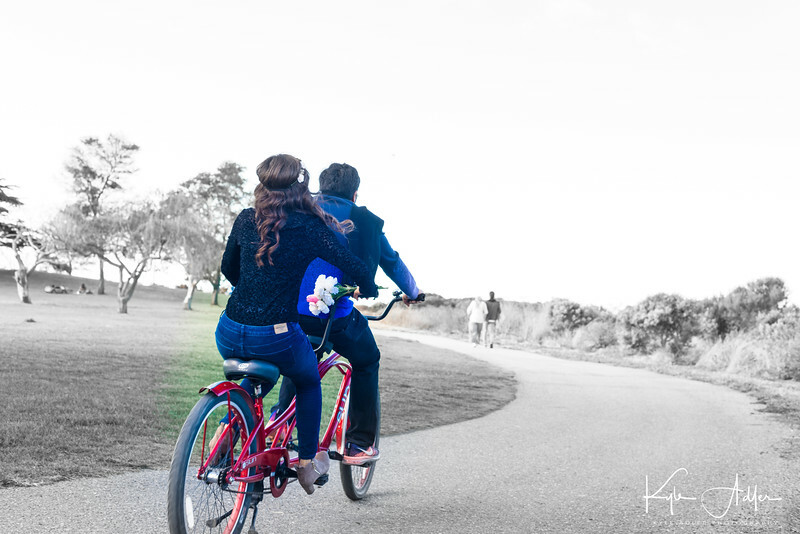 Here I panned the camera while they rode past to keep sharp focus on the couple while blurring the background. The sense of motion and tight crop lend this image a dynamic feel. Get creative during post-processing to lend your images a distinctive look. Here I retained richly saturated colors for the couple on their tandem bike, while rendering the background in black-and-white. This juxtaposition gives a magical, Wizard of Oz-like feel to the image. 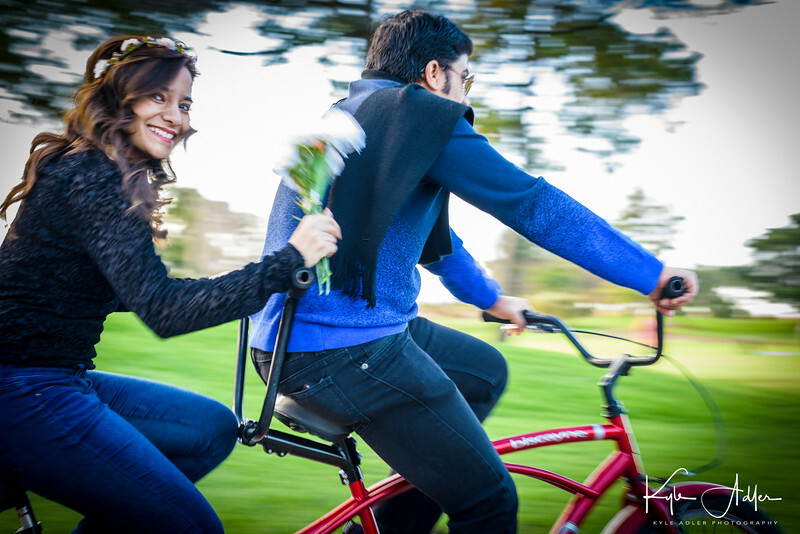 Gayathri and Abhishek are riding into their future together, bringing all the colors of the world with them. During all my photoshoots, I like to capture multiple locations (and preferably multiple outfits) in order to give my clients a varied portfolio of images spanning different moods and backgrounds. 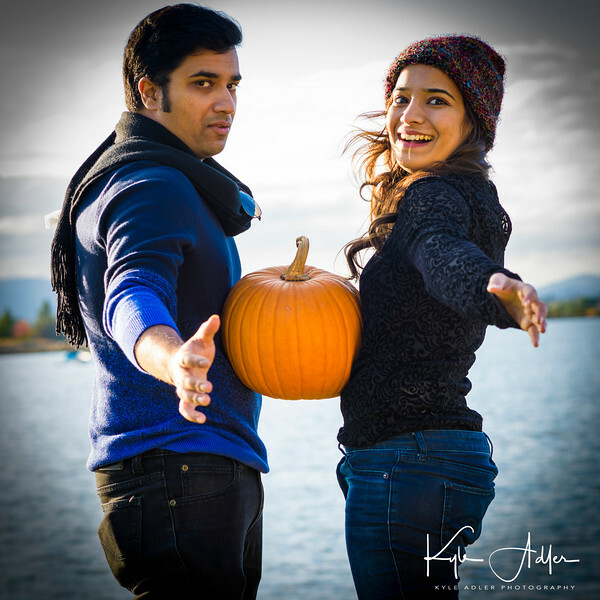 Finding a miniature pumpkin patch by the shores of a sailing lake gave us a playful prop for a new series of images. An 85mm portrait lens set to a moderately shallow depth-of-field allowed me to capture this playful scene. I wanted the couple to be pin-sharp while the background was slightly soft but still recognizable as a lakeside setting. Just remember when shooting groups of people that you need a deep enough depth-of-field to ensure sharp focus on all of their faces; for that reason, I don’t usually recommend shooting wider than about f/2.8 for couples or about f/4 for larger groups. While I may suggest a few poses or ideas to my clients, I’m not a fan of staged poses. Instead, I like to let the couple interact as they naturally do. This priceless moment captures their sense of fun and their flair for the dramatic. A wide aperture allows for sharp focus on the couple while softening the background to keep the emphasis on them. I always ask my clients to bring a few props with them that represent something they love to do together or reflect their interests. 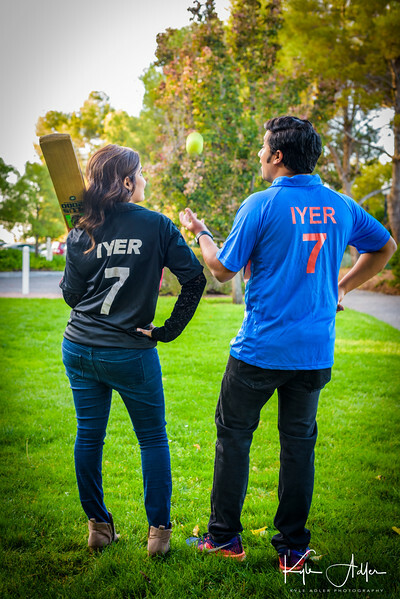 Because Abhishek is a huge cricket fan, he and Gayathri posed with bats and balls while wearing shirts emblazoned with his name and number. These kinds of shots emphasize what is unique about the couple. Remember to shoot from all angles: above, below, front, back, left, and right. Sometimes the best images are not shot from the conventional perspectives. 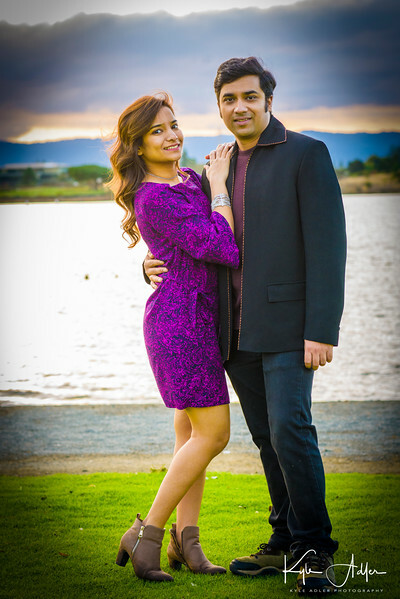 If possible, try to include time for the couple to change outfits at least once during the shoot. This allows for more styles and moods, and provides images that can be used for more purposes. The grounds of a lovely Victorian mansion provided a great backdrop for another shooting locale after an outfit change. Both Gayathri and Abhishek have dance experience, so it was natural they would want to perform for the camera. Whenever the action is fast-paced, be sure to shoot with a fast shutter speed and the appropriate focus settings, and keep shooting continuously to ensure you catch just the right moments. I often try to schedule shoots for just before sunset when the “golden hour” lighting is soft, flattering, and evocative. My favorite technique for portraits is to shoot with the sun behind the couple. This provides lovely lighting on the hair, a beautiful saturated background, and a relaxed squinting-free pose. To make this technique work, I meter off the subjects’ faces to avoid their becoming silhouetted, and I often use a reflector to shine some of the sunlight back onto their faces and fill in the shadows. An assistant can be very helpful for holding the reflector. Parting shot: This lovely capture was made by spot-metering off the couple’s skin and having my assistant aim a gold reflector onto their faces. Do you have tips and techniques for shooting couples? Please share them here. Want to read more posts about photographic techniques? Find them all here: Posts about techniques. Note: These private client images are not available for purchase.